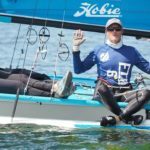 What a week at the Hobie 16 NAC! 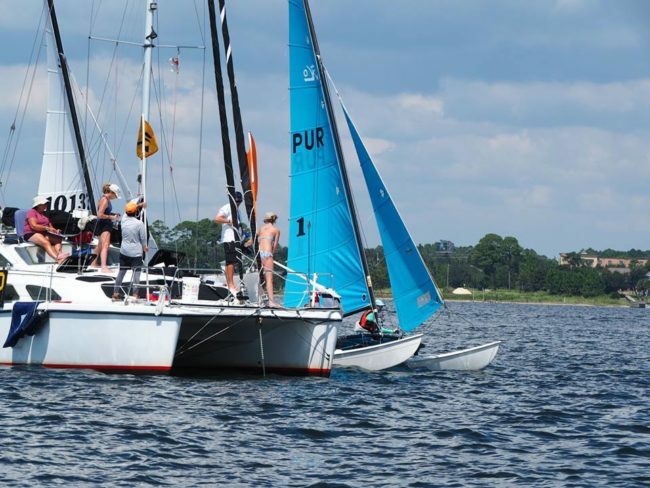 Sailors battled light, shifty winds all week, and position changes occurred daily. 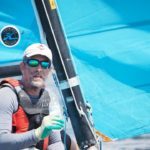 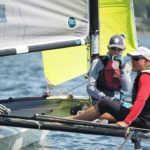 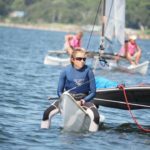 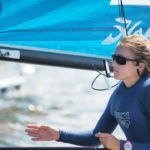 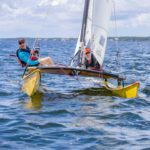 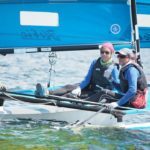 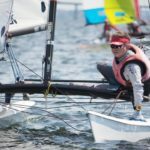 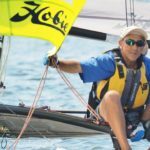 Congrats to the 2018 Hobie 16 North American Champion! 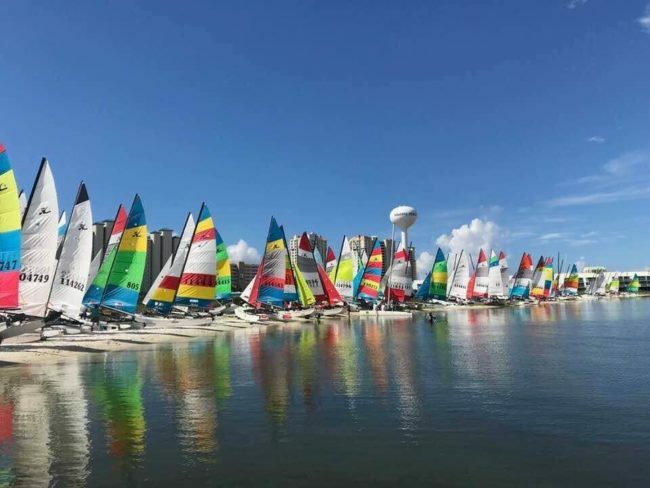 Juana’s Pagodas and Sailors’ Grill. 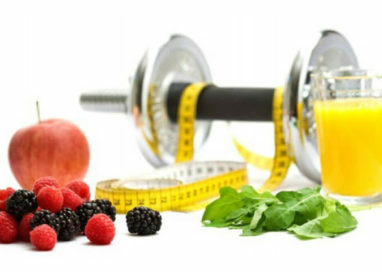 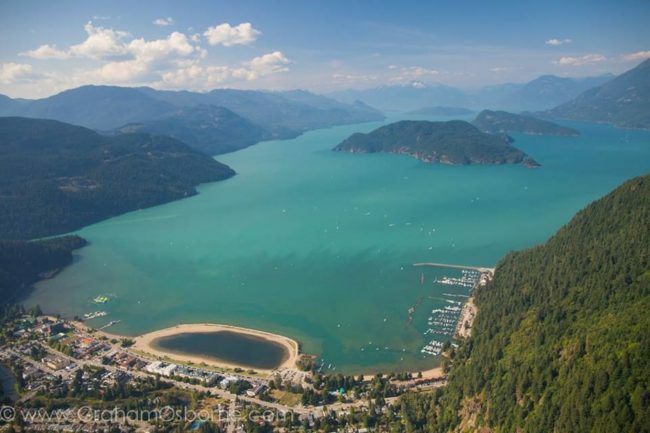 I hope to see you next year September 16th to the 20th, at beautiful Harrison Hot Springs, British Columbia, Canada. 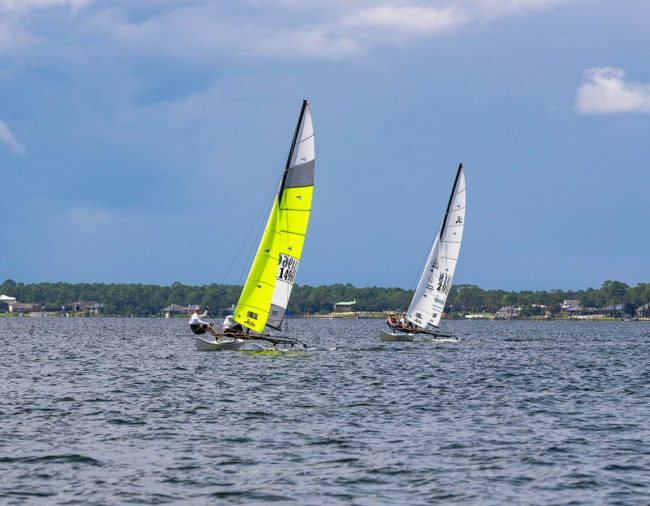 The Hobie 16 North American Championships concluded with today racing. 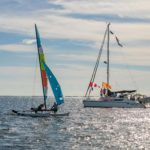 After an on-shore delay while the wind filled, two additional races were completed in 8-10 knots. 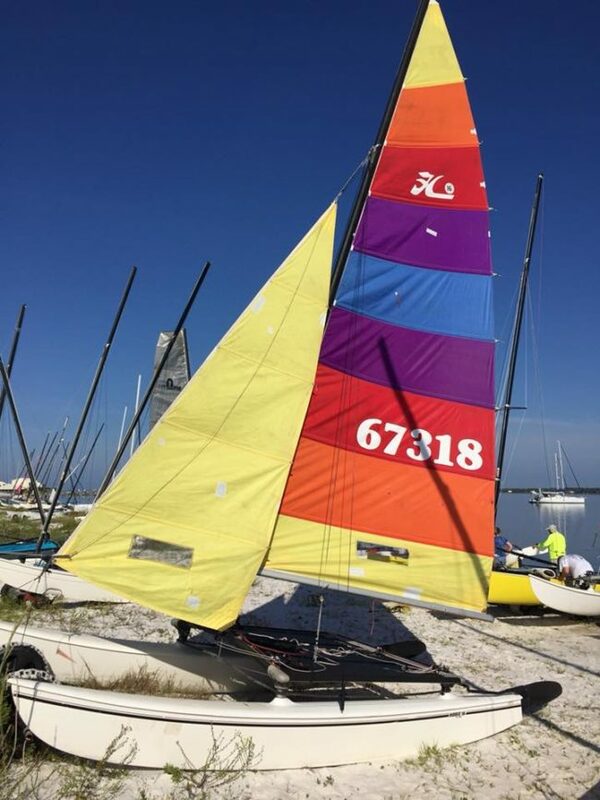 While still not the breezy conditions Hobie 16 sailor’s love, it was just enough to single trapeze. 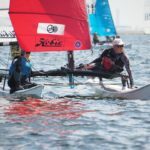 After four days of light wind, the breeze brought smiles to the sailor’s faces. 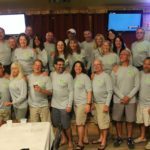 The annual Hobie 16 North American Championships is always a reunion of the Hobie sailing family. 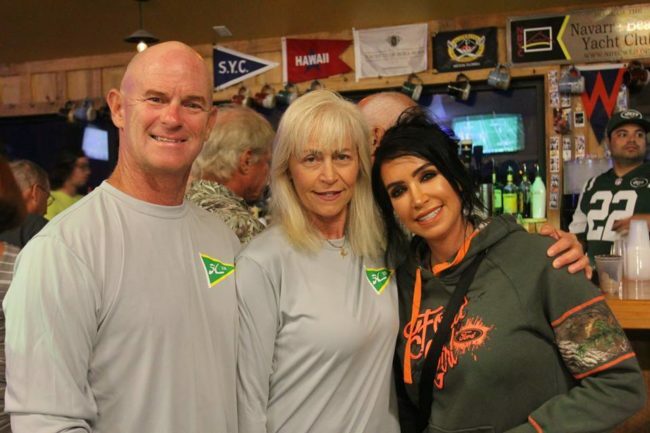 It’s an opportunity to spend time with friends from around North America. 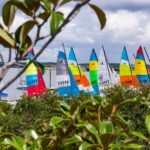 Florida always attracts a big turnout and this event did not disappoint. 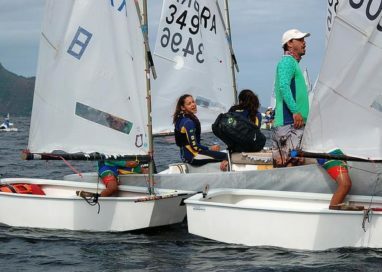 Enrique Figueroa/Melisa Gann (PUR) wins the championship. 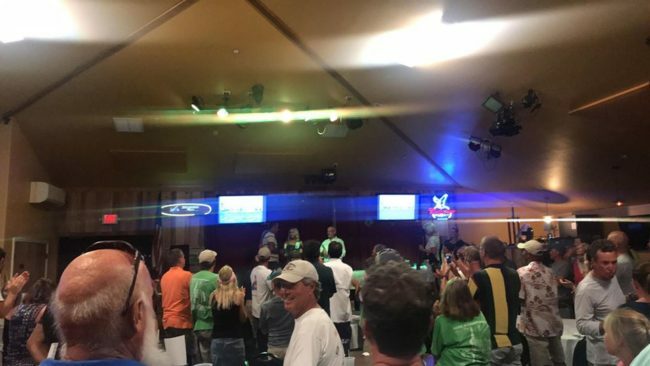 There was a four way tie for second place with second going to Mark Modderman/Alexander Liu (USA), followed by Pat Porter/Heather Mattews (USA) and Mike Montague/Kathy Ward (USA). 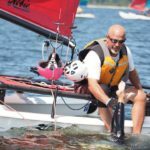 Next year’s championships will be held in September 2019 in Harrison Hot Springs, British Columbia. 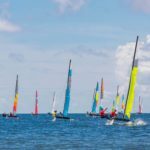 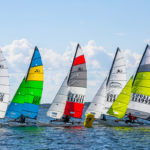 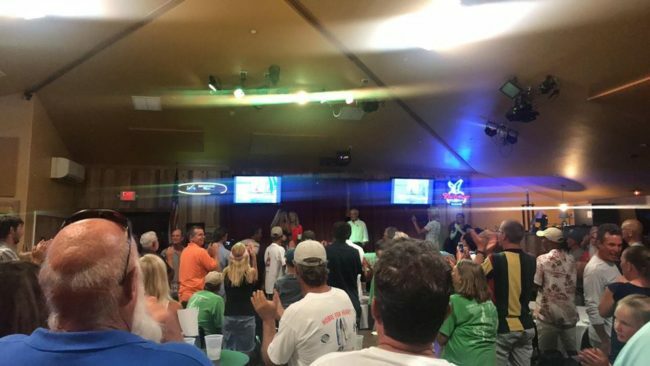 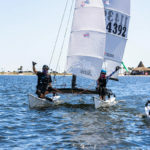 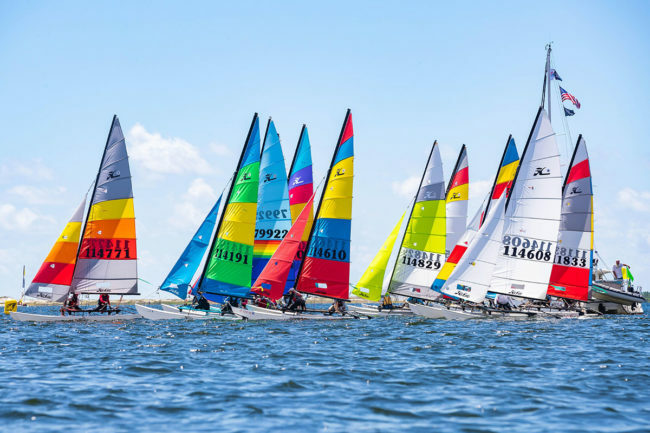 This year’s event was the qualifier for the 2019 Hobie 16 World Championships 1st November – 16th November 2019, at Captiva Island, Florida, USA. 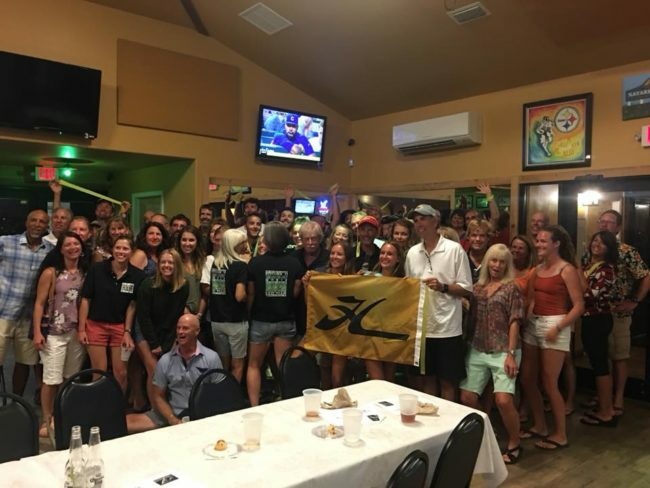 I thank Camila Niño Gil John Holmberg’s crew member who is currently at the North American hobie cat championship awards party 16 and together with the sailor and great hobie cat reporter Raul Heviais recording the unforgettable moments that are happening at the moment! 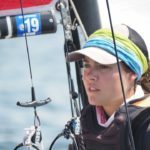 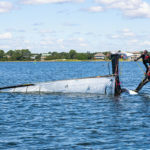 I thank the sailor Camila Niño, Gil John Holmberg’s crewmember, who had to stop sailing in the middle of the group series, as John had to travel to North Carolina to help his mother North against the dangers of the hurricane. 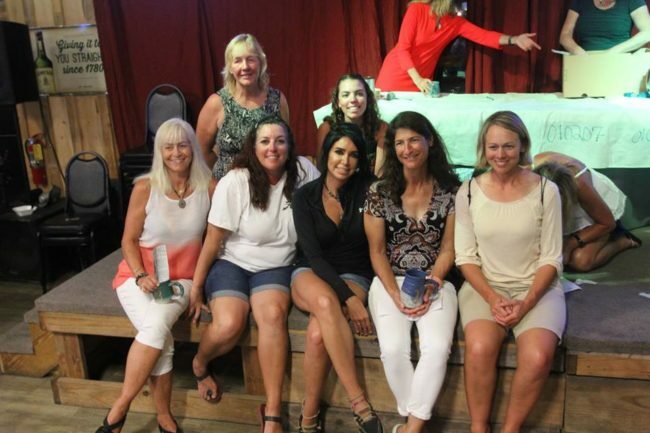 Even without competing she still stayed in the league and sent those wonderful photos. 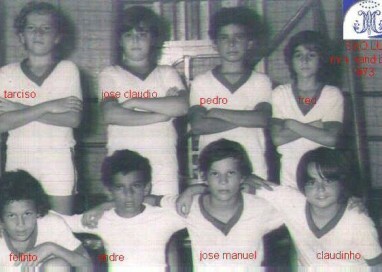 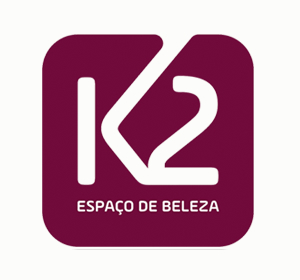 Thank you and I invite you to come to the Brazilian Championship from October 27 to November 2 in São Paulo. 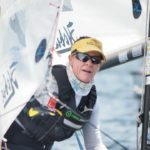 Good winds! 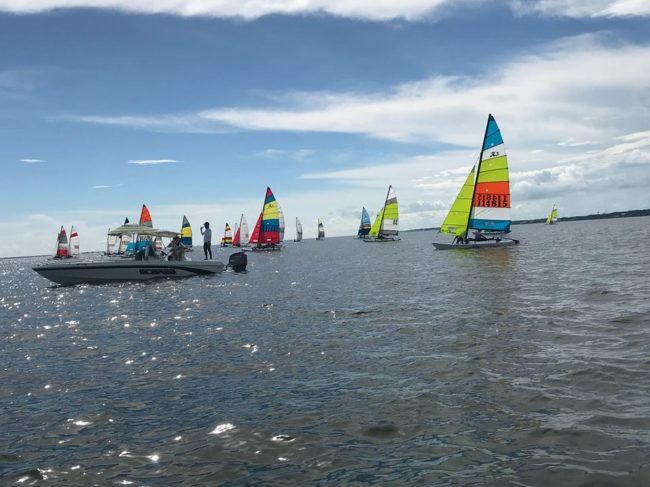 Day four of the Hobie 16 North American Championships seemed like ground hog day as it was a repeat of weather pattern we have been seeing all week with some dolphins and thunder mixed in. 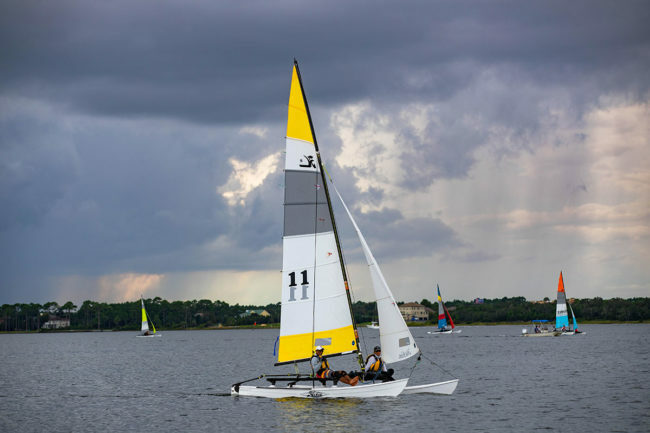 Racing started promptly at 10:00 AM, three races were completed in 4-8 knots of wind with the same slow but persistent right shift all day before a thunderstorm brought an end to the day. 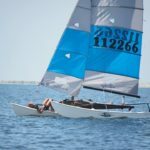 A pod of dolphins was swimming with the boats all day. 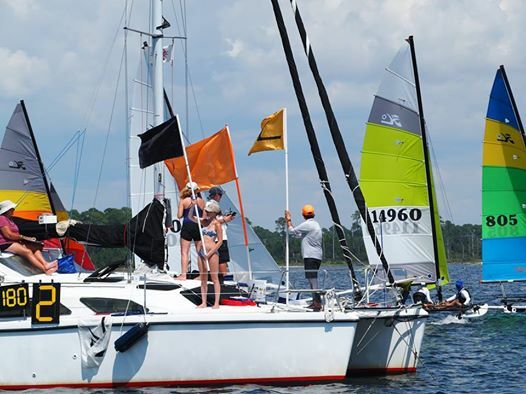 The gold fleet was a bit aggressive on the starts a few general recalls bringing out the U and black flags. 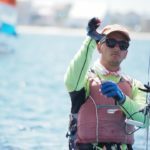 Former Hobie World Champion Enrique Figueroa continued his very consistent sailing to extend his overall lead in the championships. 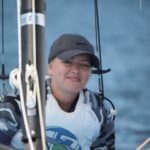 Enrique Figueroa/Melisa Gann (PUR) continues to lead followed by Pat Porter/Heather Matthews (USA) and Brian Lambert/Rebecca Lambert (USA). 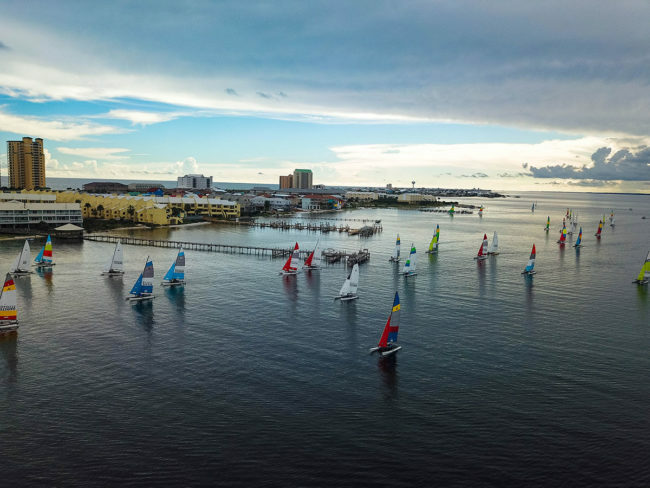 Racing continues through Friday. 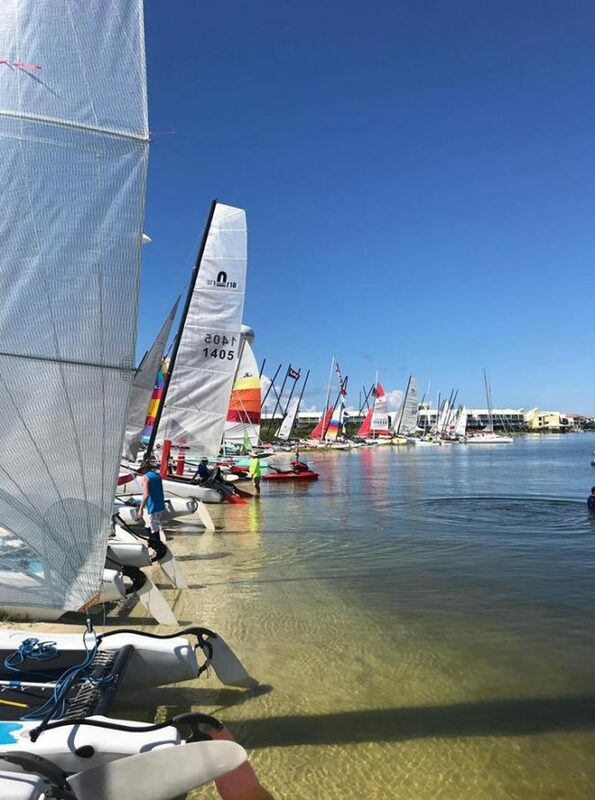 Photo by Jason Sanches Tuesday, 11 setember, morning:Beautiful image of the assembled boats waiting to leave for the regattas of the day. 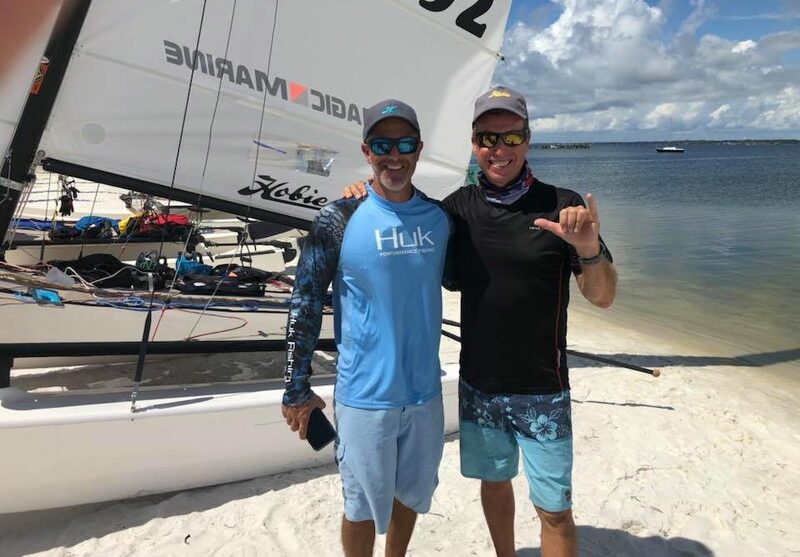 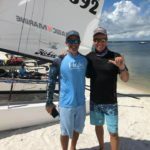 Today, September 11, three contests were disputed and the leadership of the North American Championship of Hobie Cat 16 version 2018 now is of the pair of Puerto Rico, Enrique Figueroa / Melissa Gann, followed closely by the experienced sailors Mark Modderman /Alexander Liu and Ken Hilk /Darcy Jensen in second and third places respectively, both tied with 11 points lost and only 1 point from first place. 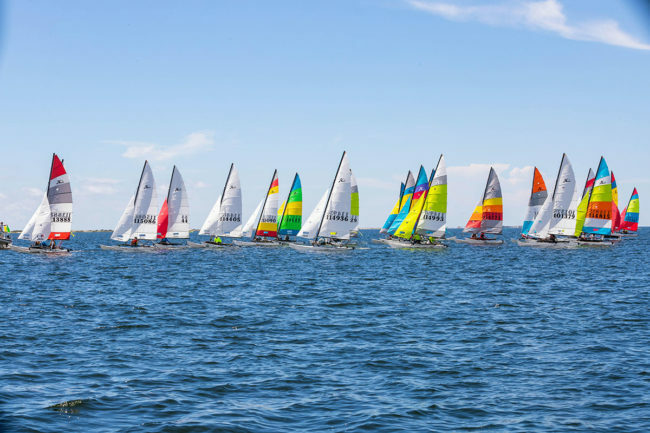 We must point out that during these 3 days, that is, yesterday, today and tomorrow, the championship is being played with the presence of 65 boats divided into groups. 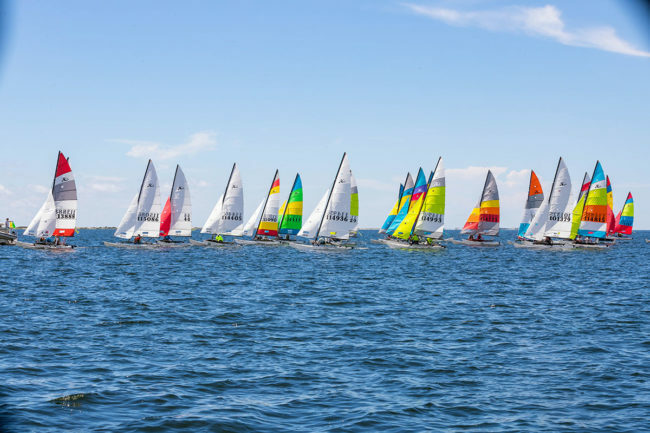 After these 3 group days, the 40 best ones will have to follow in the gold flotilla in search of the maximum title and the rest will contest the silver fleet regattas. 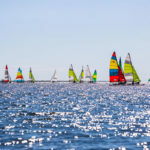 The championship is being held until September 14 at Navarre Beach Florida located in the panhandle of Florida, 30 minutes east of Pensacola Beach. 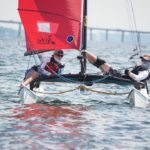 This demonstrates the great technical level of this championship and, better, it would serve as a landmark for the American team preparing to defend their country in the 2019 World Championship at home. 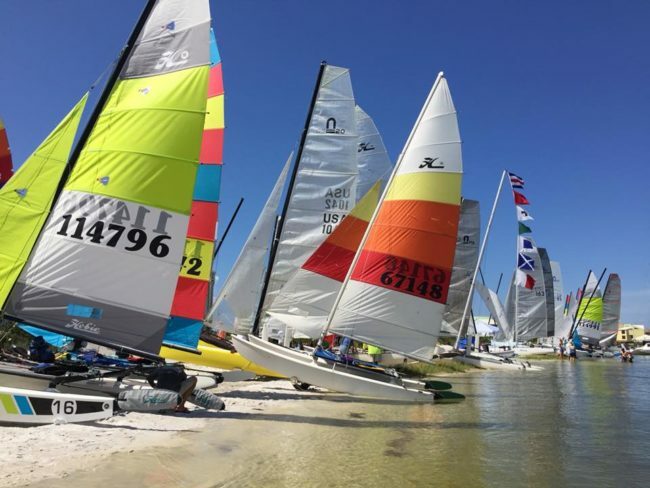 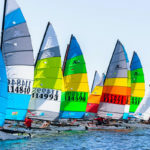 As we can see that the Hobie cat 16 National Championship, which is now being played, will serve as a warm-up for the 22nd hobie cat 16 World Championship which will be held from 1st November – 16th November 2019, with its official headquarters being the beautiful South Seas Island Resort, located in Captiva Island, Florida, USA. 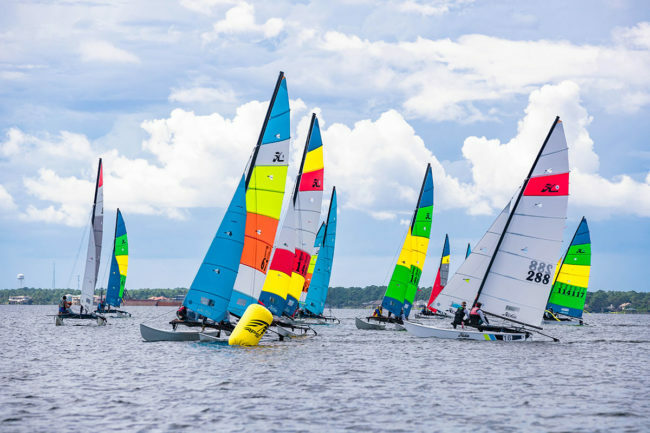 Sailing will be in a round robin format for the first three days. 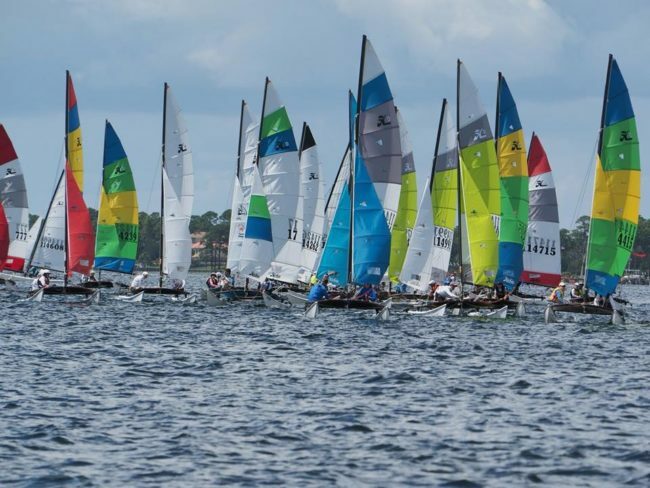 After day 3 the top 40 will move on to the Gold fleet and the rest become the Silver fleet. 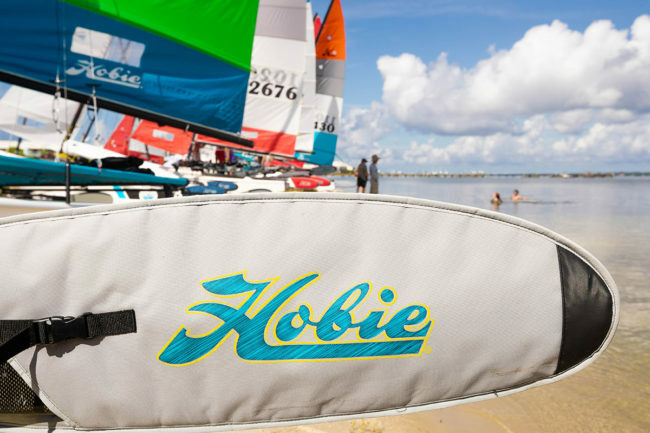 The Hobie Association of North American has announced that the Hobie 16 North American Championship 2018 is being played in Navarre Beach, Florida. 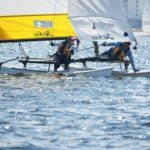 Today, Sunday 09, was the day of inscriptions, measurements and weighings and the championship follows until September 14, 2018 directly following Juana’s Good Time Regatta at the same location. 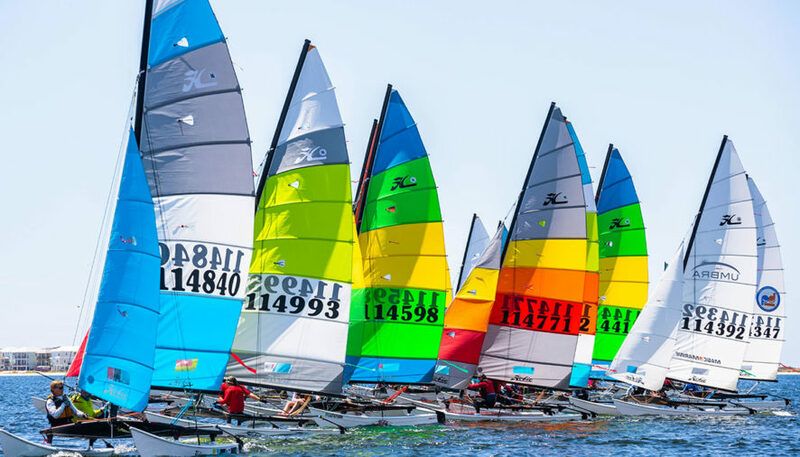 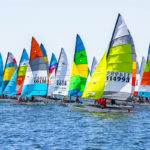 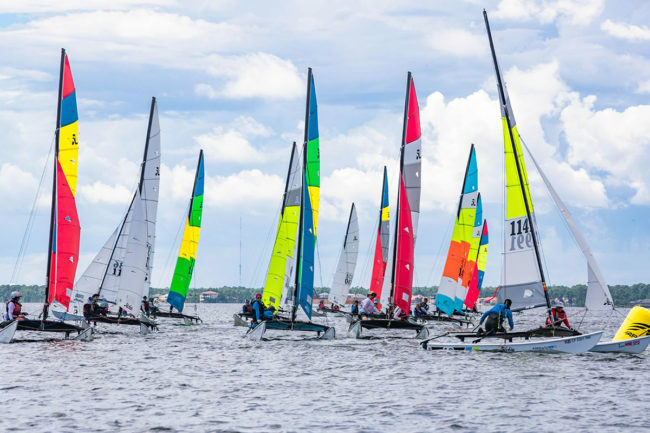 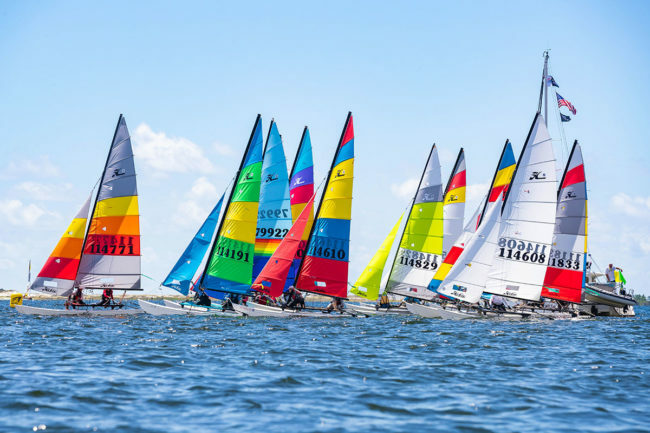 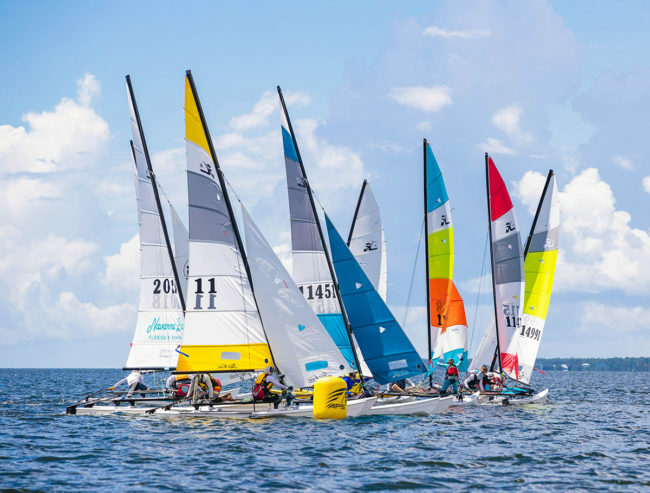 This event will coincide with the 20th Anniversary of the passing of Carleton Tucker and will be referred to as the Carleton Tucker Hobie 16 North American Championships. 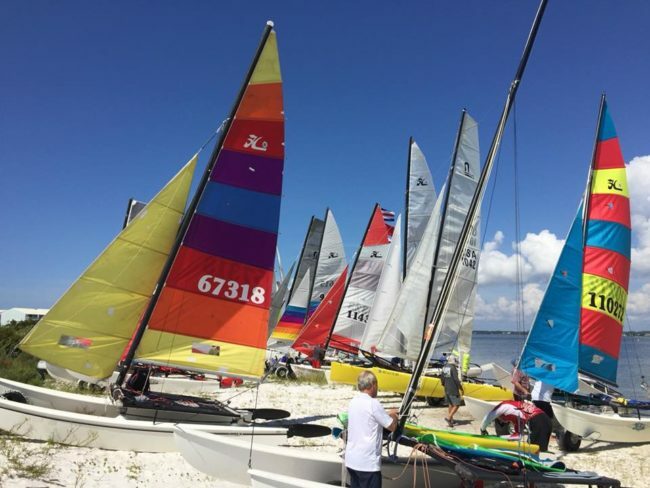 This event is being hosted by Hobie Division 15 with Hobie Fleet 35 and 178. 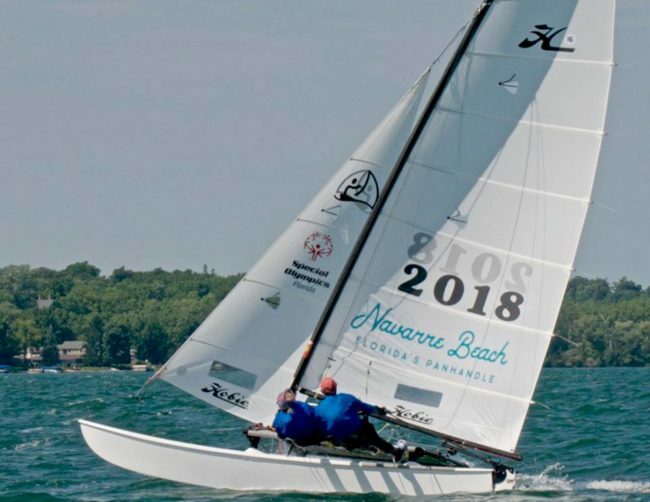 While the North American championship does not begin the president of the Class in the USA Rick McVeigh sails in his beautiful Hobie cat 16 next to its companion Cindy Noël Alves (photo by Cindy Noël Alves´s facebook) enjoying the touch in the command of the trapeze. 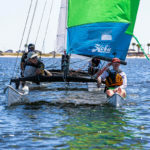 The boat is flying low and demonstrates the technical quality of the crew and from now we can predict that the disputes for the title of champion will be very fierce.Note that the boat is already sailing with the mark of the place where the races will be played in Navarre Beach Florida´s Panhandle. 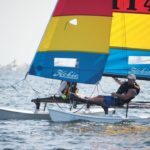 Very beautiful to see this boat sailing! 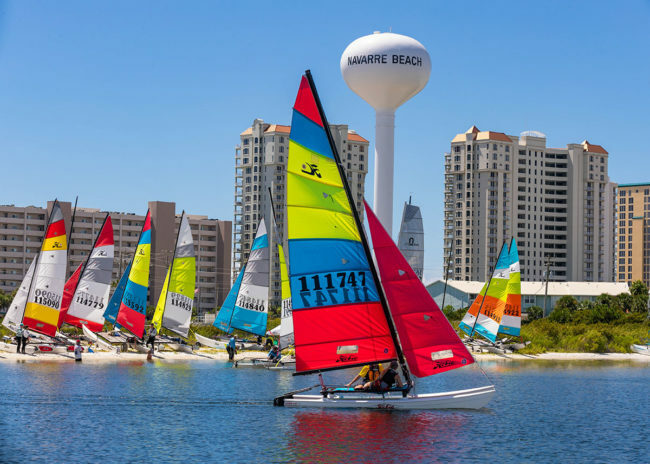 Navarre Beach Florida is located in the panhandle of Florida, 30 minutes east of Pensacola Beach and just south of I-10. 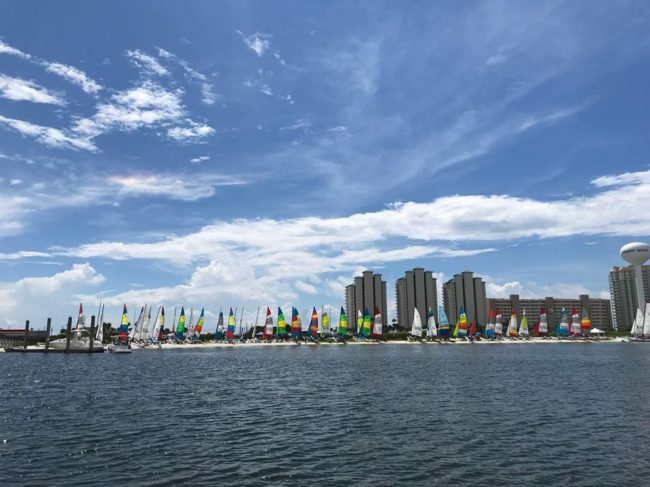 There are many hotel, condo, house and apartment options for awesome accommodations, all located within a few minutes of the regatta site. 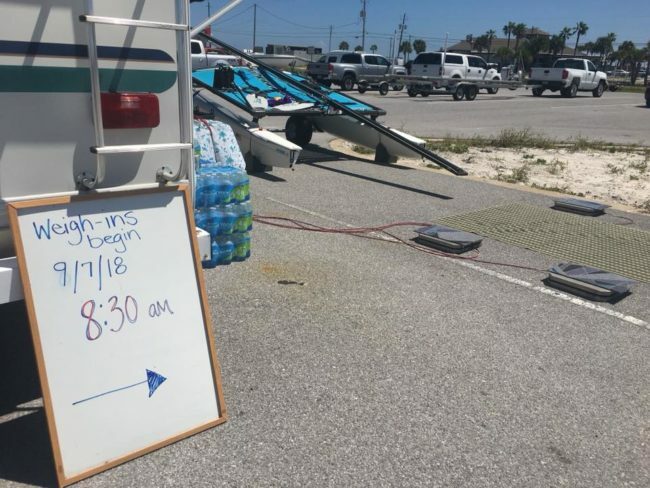 The weather in Navarre Beach is expected to be in the low 80s, moderate winds from the North (30% of the time) with humidity to be moderate (below 70%) and pleasant all the way around. 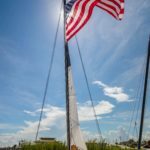 For those travelling to and from the causeway, it is bicycle friendly . 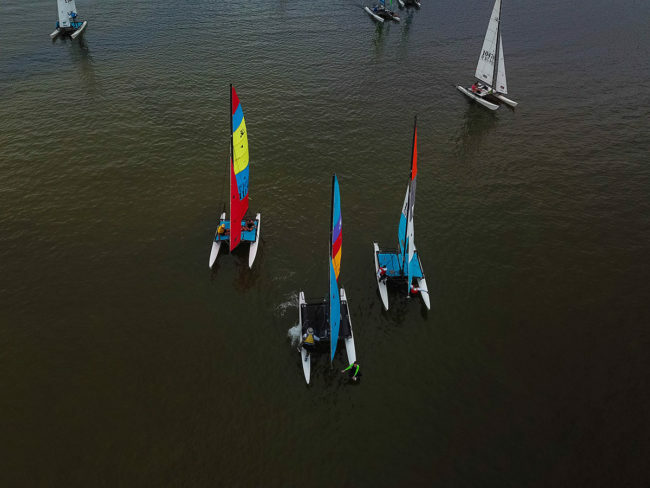 Click on the address to show you the accommodation on Google Maps. 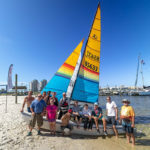 Navarre Beach is the beach neighborhood of Navarre. 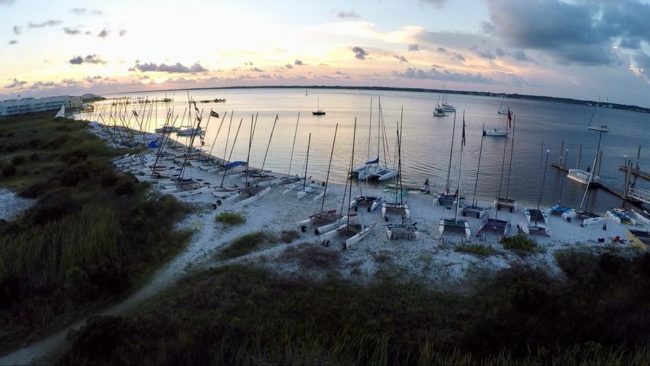 It is on Santa Rosa Island, a barrier island in the Gulf of Mexico.. 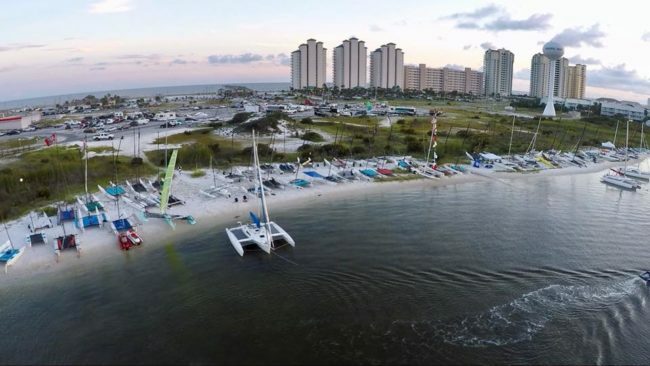 Immediately to its east is Navarre Beach Marine Park, a former Florida state park. 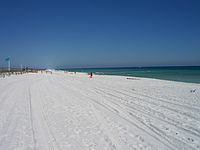 Immediately to its west is a portion of the Gulf Islands National Seashore, and farther west is the city of Pensacola Beach. 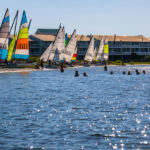 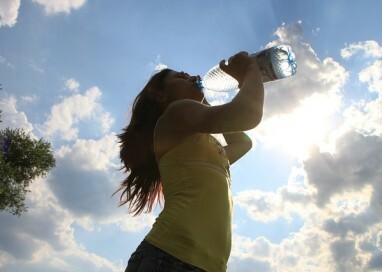 On March 26, 2006 a “beach renourishment” project was begun, restoring sand lost due to the hurricanes of 2004 and 2005. 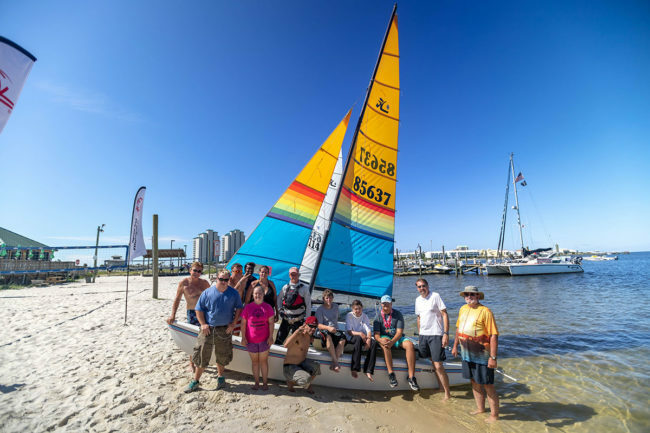 This project eventually added approximately 200 feet (61 m) of sand and a 14-foot (4.3 m) high berm to the Gulf side of Santa Rosa Island for the entire length of Navarre Beach. 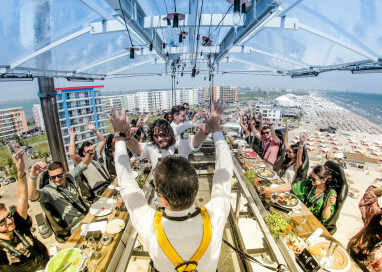 The project was completed in December 2006. 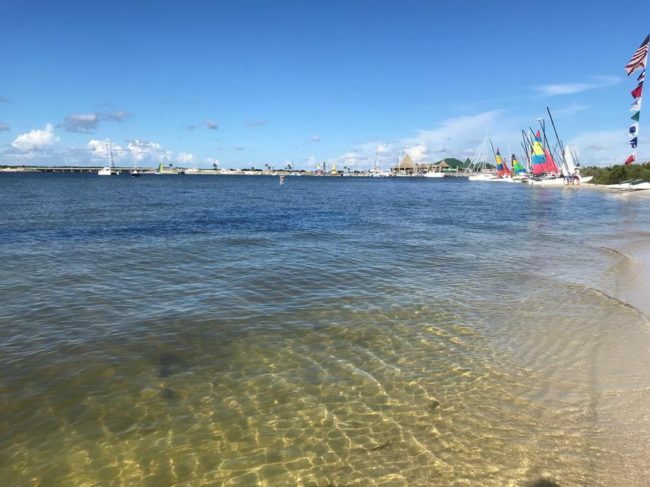 Another round of beach renourishment was completed in 2016.